Like all mints, Orange Mint, should be confined to a pot. 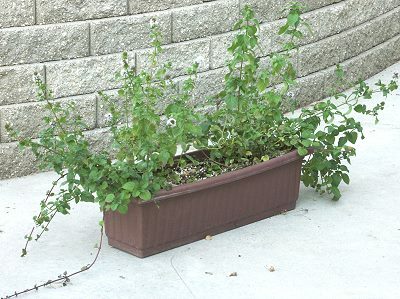 Mints grow better in pots with lots of surface area rather than lots of depth. This window box is a perfect container. This box was planted in June with two of our three inch pots. By September, it is nice and full and even trying to escape. Notice those long runners heading off the sides of the box. If these found moist dirt they would root and put up new stems. By next spring, this Orange Mint will need to be divided and repotted with fresh soil. Orange Mint is one of the six plants chosen to be in our Zone 5-11 Tea Herb Garden. This plant is often available in plug trays. These trays hold 128 of all the same plant. They are a great low cost way to fill a lot of space. Each cell is 3/4 of inch by an inch. Check here to see if Orange Mint Plug Trays are available.